As an oil field is produced and the reservoir depletes under primary production, the pressures in the formation decline. As pressure declines, it becomes more difficult for hydrocarbons to flow to the surface naturally. 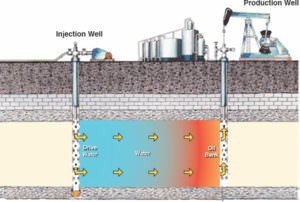 And because we hate to leave anything behind in the reservoir, waterflooding is a commonly used technique of enhanced oil recovery (EOR). Waterflooding helps produce more of the reserves that remain in the reservoir, a process called secondary recovery. Waterflooding provides two main benefits to enhancing production. The first is the re-pressurization of the producing formation. The second benefit is that the water helps displace or ‘push’ the hydrocarbon to the production wells in the field. In waterflooding, water is pumped down an injection well and into a reservoir that is currently being produced by offset wells. In TAG Oil’s case, the water is extracted from a deep and sustainable formation where the water is naturally too saline for agricultural use. The saline source water is produced up the A-9 well via Electronic Submersible Pump (ESP) to onsite tankage. The water is than treated and filtered at the surface, before an injection pump transports the fluid to Cheal B-3 for injection. Injection into Cheal B-3 commenced on September 20th 2016 and water rates have been brought up to approximately 1,600 bbls/d. In recent years while oil prices remain low and the supply / demand balance sorts itself out, TAG’s main focus has been on increasing existing production with economical workovers and waterfloods.